Star Song 7-10-205386. Farrell and Farrell. 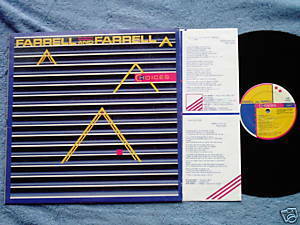 Choices (1984) LP. Tracks are Hosanna Gloria, He Will Always Make a Way, Get Right or Get Left, Through your eyes, Ransome, He reigns, The greatest of these, Choose to love, Give me the words, He is there. Produced by Ed De Garmo and Bob Farrell for Mint Prooductions. Photography by Craig Stewart. Vinyl is VG; cover with photos is VG with some creasing on front; original lyric sleeve with designs.